Foam rolling, also known as self-myofascial release, is a popular way of relaxing your muscles and releasing tension. It works by applying pressure to your body’s fascia, which is a system of connective tissue that runs throughout your body supporting your internal structures. When fascia loses it’s pliability, it can become tight and restricted. This can happen through sudden impact injuries, like a fall, or through overuse injuries that might occur from playing a sport or exercising.¹ Poor posture over time and inactivity are also common reasons that fascia might become damaged.² When this happens, movement becomes limited and if not addressed, can often lead to pain. So to answer the question, “Who needs a foam roller?”, you might think the answer is YOU. And that may be accurate in a global sense. However, with a little more insight into self-myofascial release, you might find that there are other easy-to-find objects that can accomplish the same goals as a foam roller. After all, self-myofascial release is about applying pressure to tight, restricted areas in order to release tension in the tissues. What if you used a common everyday item such as a tennis ball? In fact, you can use a tennis ball for self-myofascial release.² You can use a softball, a baseball or even a golf ball. 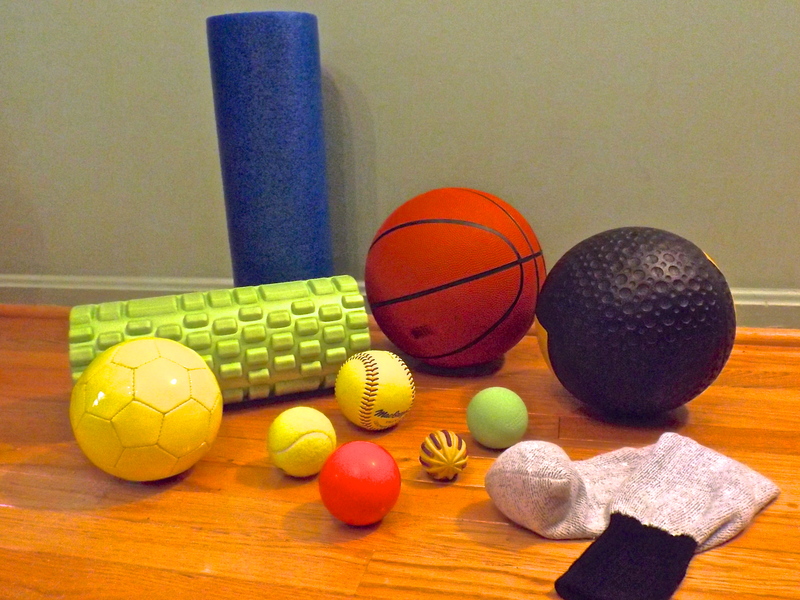 You can find things around your house that will work in much the same way as a foam roller! The key in choosing your object is to know a little bit more about how the density and surface area will affect your technique. The other factor that will greatly influence self-myofascial release is the size or surface area of the tool you use. Basic physics tells us that if the surface area is smaller, the pressure will be greater. Using an item that is larger will have more surface area and spread out the force creating less pressure (or force per unit area).⁶ In other words, a golf ball is likely to be a very intense tool, and may not be the best choice for someone starting out with myofascial release. The foam roller, on the other hand, will be much less intense and is a popular choice for the major muscles of the body. When you think outside the box, you will find that there are many different materials around your house that can be used to smooth out and reset your fascia. Pool noodles are great because you can cut them up to fit different parts of your body. You can insert a tool handle or dowel if you want to make one more firm.⁷ Towels, washcloths, and pillow cases can be rolled up tightly and used. Balls of all types are wonderful tools to use and are easy to throw in your bag and take to work. Some popular choices are softballs, baseballs, lacrosse balls and racquet balls. Larger balls like medicine balls and basketballs are also great choices, but not as easily transported. I like to throw one of the smaller balls in a long sock and use it against a wall to reach upper back, neck and shoulder areas. Ultimately, when choosing an object, be sure to pick one that you think will exert an appropriate amount of pressure on the tender regions. You don’t want to cry out in pain, but you want to be able to release any knots you might have in the tissues. Start out slowly and err on the side of larger or softer items until you get a feel for what works for you. Self-myofascial release can be done daily, and in fact, the more consistently it is done, the more potential it has to do great things for your body. By realigning the elastic muscle fibers, we can relieve the feeling of tightness in our muscles and begin to move more freely. ¹Bryant, Cedric X., Daniel J. Green, and Sabrena Newton-Merrill. “Chapter 16 Exercise Programming Considerations and Guidelines.” ACE Health Coach Manual: The Ultimate Guide to Wellness, Fitness, and Lifestyle Change. San Diego, CA: American Council on Exercise, 2013. 457-59. Print. ²Heffernan, Andrew, CSCS. “The Web of Life.” Experience Life. ©2014 LIFE TIME FITNESS, Inc., 01 Nov. 2011. Web. 14 Dec. 2014. ³McGrath, Christopher, M.S. “Why You Should Be Foam Rolling.” ACE Fit. 3 Oct. 2013. Web. 14 Dec. 2014. ⁴Brookbush, Brent, MS, PES, CES, CSCS, ACSM H/FS. “Guidelines for Self-Administered Release Techniques.” Brent Brookbush. Web. 14 Dec. 2014. ⁵Penney, Stacey, NASM-CPT, CES, PES, FNS. “Foam Rolling: Applying the Technique of SMR.” NASM Blog. © 2014 NASM National Academy of Sports Medicine, 21 Aug. 2013. Web. 14 Dec. 2014. ⁶Kurtus, Ron. “Pressure Is Force per Unit Area.” Ron Kurtus’ School for Champions. 18 Mar. 2006. Web. 14 Dec. 2014. ⁷Hester, Frank, CMT, NCTMB. “Self-Help Myofascial Release Methods.” Self-Help Myofascial Release Methods. Web. 14 Dec. 2014.